The last few days, I’ve been out camping using my Teardrop Trailer. How did we get to the campground? By towing it with an EV, of course! While I had never done this before, I was AMAZED at how well-suited electric vehicles can be for Towing! 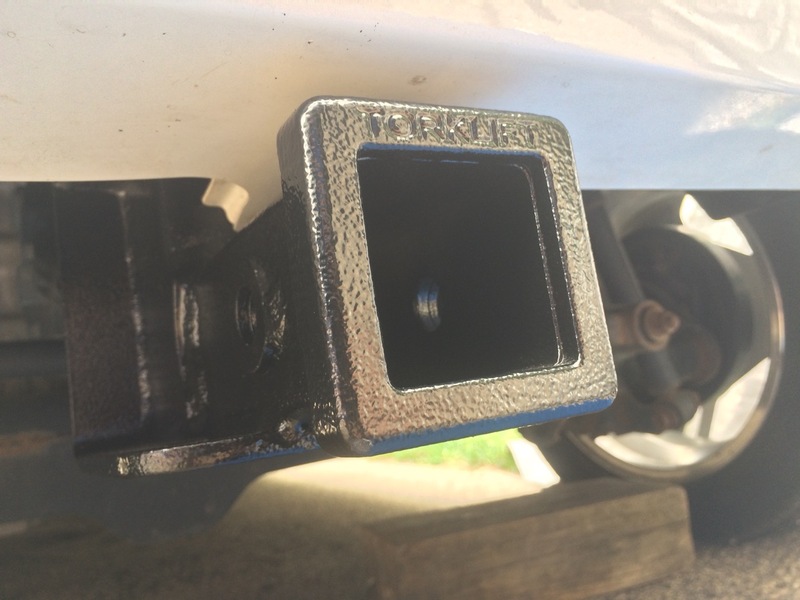 Earlier this summer, I installed a Torklift Central eco-hitch on my car. It was a little on the pricey side as far as hitches go. Unfortunately, as a “Weird Car” (there just simply have NOT been a lot of iMiEVs sold in the United States) demand just means there’s not a lot of mass-produced inexpensive accessories for this vehicle. On the other hand, the eco-hitch is very well made and extremely solid! I got the 2″ version. Among other reasons, it works well as a receiver for a bike rack, rear support for lumber, or all sorts of other utility-adding devices which could be inserted. Our camping trailer is something that I built back in about 2005. It’s really my first true DIY project, and is part of what later lead me to building electric motorcycles, electric cars, and renewable energy projects. The trailer is small enough to be pulled by a car, yet still features a full kitchen and an insulated sleeping compartment. I hitched up the trailer, took it for a ride around the block for a shake-down test, and then headed out to the campground. The campground was less than 20 miles away, and I had NO IDEA what I would get for range from my tiny battery pack. However, I assumed that even if I got HALF the range of normal, we would still be able to make it to the campground just fine. I played around with the gear selections in my car and found that both the “E” (Eco) and “B” (Brake) modes worked well. Both modes provide firm regenerative braking when I let completely off the accelerator. The car is rear-wheel drive, so the tongue of the trailer puts weight right over the drive wheels – perfect for towing! Normally, I would have towed this trailer with an S10 pickup truck. Unfortunately, the truck has over a quarter million miles on it, just doesn’t run great, and the exhaust is loud. Combine that with a manual transmission, and it’s actually a little bit of a pain to tow with, especially in stop-and-go traffic. On the other hand, the Mitsubishi’s single speed gearing means that there’s NO SHIFTING AT ALL! Even when I had my old Dodge Shadow for towing the trailer, the automatic transmission was terrible about down-shifting to second gear when going up big hills! 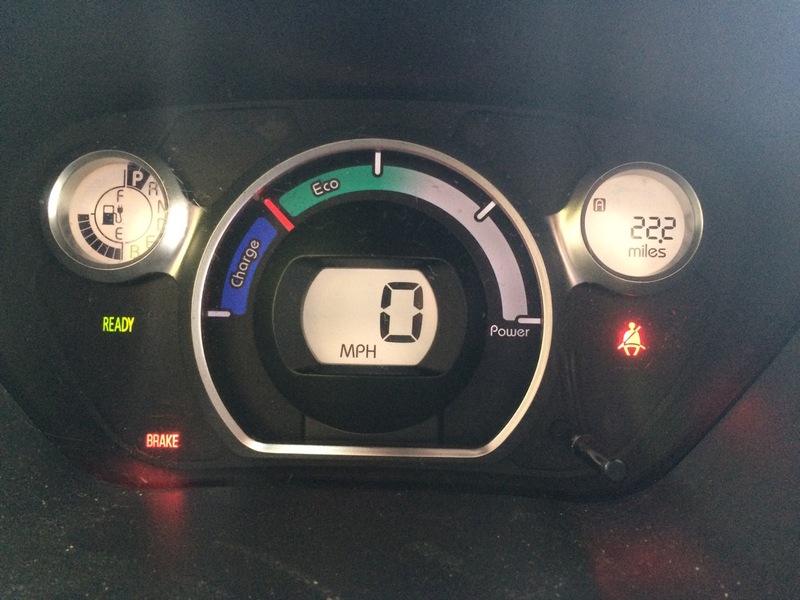 The iMiEV’s instant torque also meant it kept up with traffic just fine pulling away from stop signs and lights. 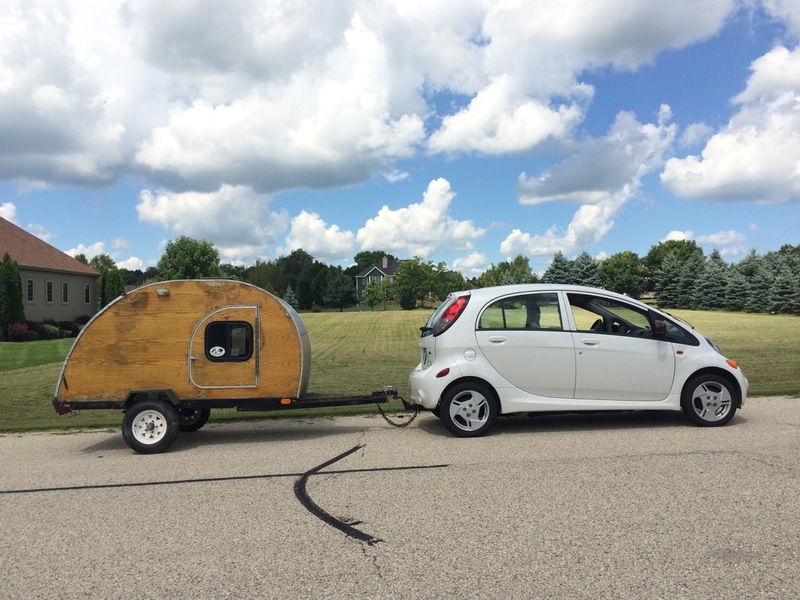 The EV was a JOY to TOW with! The trailer is built on a 4’x8′ utility trailer frame. The proportions look a little off. The trailer appears just a little too tall for how wide it is…. Exactly like the Mitsubishi. 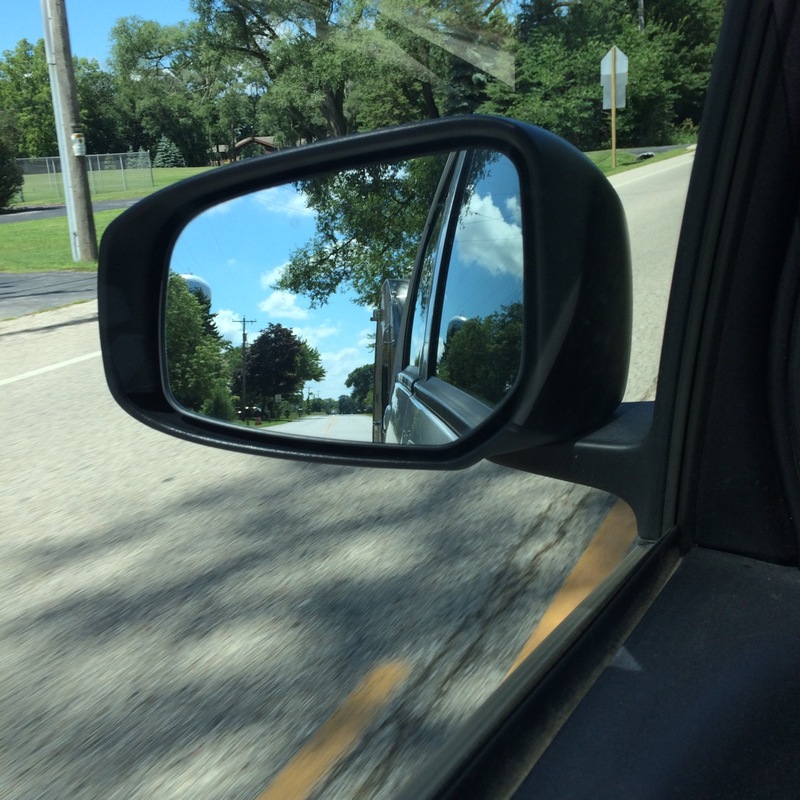 In fact, another great thing about towing was that my exterior rear-view mirrors had a clear view straight back on both sides of the car and trailer. 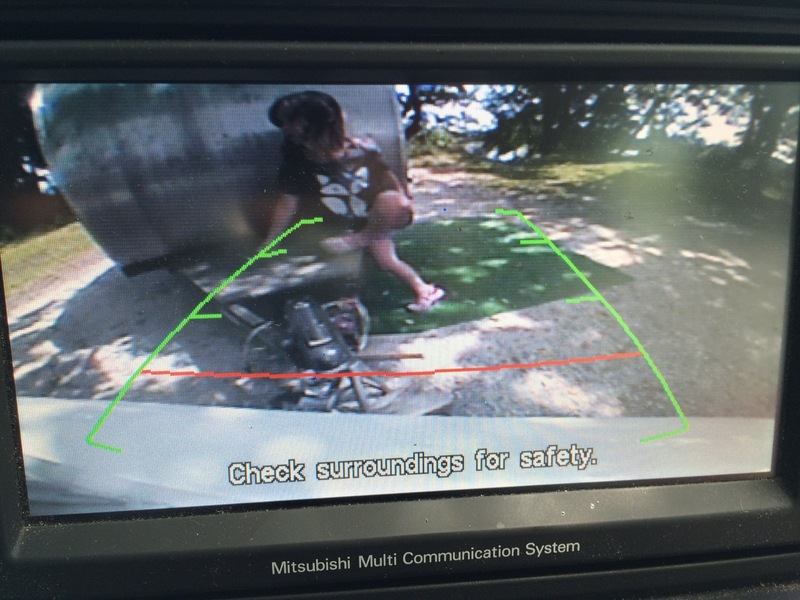 No need for “Mirror Extenders” like you sometimes see on large pickup trucks! When we got to the campground, I was at exactly half the battery pack, and had traveled 22.2 miles. The campground is actually closer than that, but I had to run an errand and stop for ice on the way there. The Range Remaining meter let me know I had about another 20 miles worth of travel available in the battery pack. So, it looked like my range with the trailer was about 42 miles! Since the official EPA range on the car is 62 miles, I figure I lost about a third of my range when pulling the trailer. Not bad! If it was only half, I still would have been happy. There’s plenty of GREAT state parks and campgrounds within 40 miles of my house! Our friend ended up not being able to make it out the first night, so we checked in using her reservation, and set up camp. However, we never originally intended to make an electric car trip out of this, and we weren’t in charge of the reservation, so it was a NON-Electric site – no place to charge. But there were lots of available camp sites with electricity. I hiked over to the Camp Host site to say hello and ask about the best place to charge the car. Unfortunately, nobody was in at the Host site. The next morning, I intended to unplug and move the car BACK to our site. Of course, I’m not much of a morning person, and tend to be in a thick mental fog until drinking about a quart of coffee. So, when I was walking back from the bathroom building the next morning I COMPLETELY forgot about moving the car. That was even after how I mentioned that I would have if I was in charge of the reservation, I had specifically come looking for him the night before to ASK about charging, and mentioning how I usually make a donation to the park for more than my fair share of electrical use. I sheepishly explained that I had, then why I had, what the expected cost was, and my typical voluntary park donation. After that, the Ranger had some questions about my car. (“You towed with that! Nice!”) Pretty soon, he was asking about winter heating, range, 120 vs 240 volt charging, and what I know about Teslas. Yep, I suppose it’s true. I end up doing a lot of talking about electric cars in parking lots and out on trips. There still just aren’t too many of them out there. People usually have a lot of questions and misconceptions about electric cars. 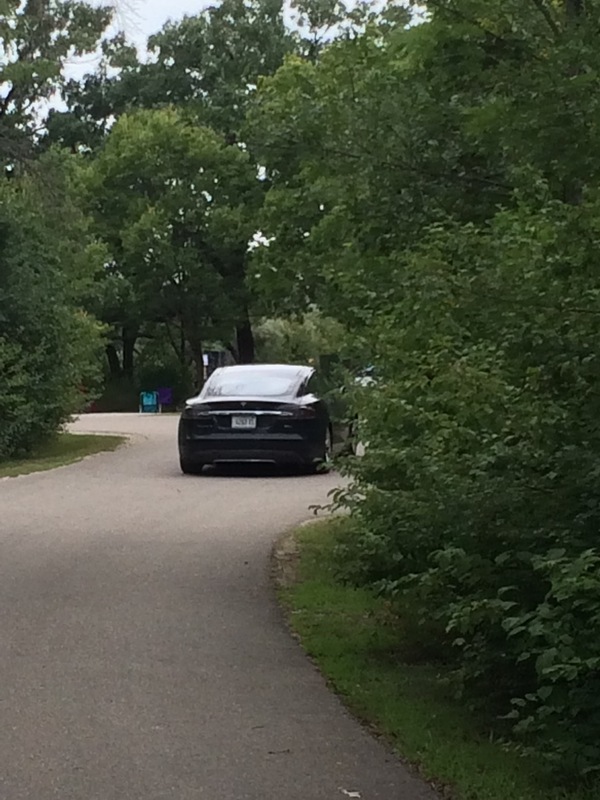 I guess I was just pretty excited to see another electric car at the campground, and maybe I should have tried catching my breath before speaking with them. It was a couple in the Tesla, and clearly they were camping, as the back seat was packed with tents and sleeping bags. I actually didn’t know if they were coming or going and I wasn’t able to find them again later at the camp ground. I also didn’t catch the license plate, but it was from out of state, either Illinois, or possibly Michigan. My area is considered “Up North” to folks from Chicago, and there’s a long tradition of Chicagoans coming up here ever since the Gangsters of the Prohibition era. For the rest of the time on the trip, we had camp-fires, went swimming, and hiked out to an area that included a fish farm and spring house from about 100 years ago. We even found a Neil Young album at the park’s Free Little Library, which we loaded into the car’s media player, and then returned. One evening, the numerous kids were at camp, all being especially noisy and quarrelsome. 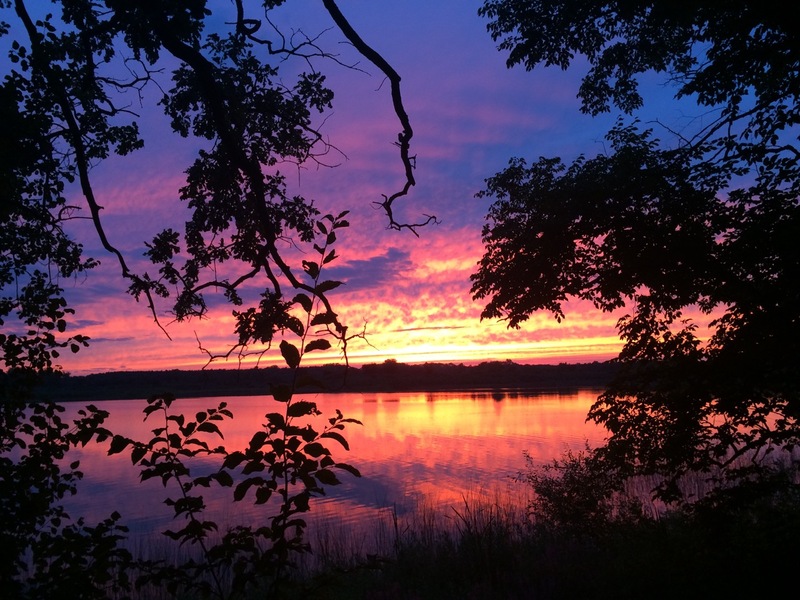 It was sunset, and I dragged my wife away for a minute onto the walking path behind our camp site, which faces the lake. Hiking only 50 feet or so away, it was suddenly very quiet, just the sounds of the breeze and the insects, and a great view of the sunset reflecting on the water. It also let us reflect on the fact of how good it was to have each other and only ONE very well-behaved young daughter! The trailer was again a joy to tow home. There’s all sorts of advantages to owning an electric vehicle. For me it was both for financial savings and the ecological advantages. But to find out how great it also was for towing, was just icing on the cake. PS: Tesla camping is becoming a thing. People will just fold down the back seat and sleep inside. It’s completely possible to run air-conditioning all night, although that sounds an awful lot like “Glamping” to me. I’m sure people do the same with the Volt as well. The iMiEV may be just a tad small for that, although how the back seats fold completely flat is one of my favorite features of the car. PPS: Of course, the main disadvantage to towing with an EV is that it shortens an already short range. If this is a big issue, plug-in hybrids like the Chevy Volt are a great solution. I also have a friend who just towed a Teardrop most of the way across the country with his Tesla Model S. The larger battery pack and available SuperChargers make a trip to a place like the Grand Canyon completely possible. In the mean time, I’ll just check out some GREAT parks close to where I live! PPPS: RV Parks are also the hidden majority of existing electric car charging infrastructure! Besides PlugShare, you might want to try RVParky as a great app for finding places to charge your electric car! You Go Ben! 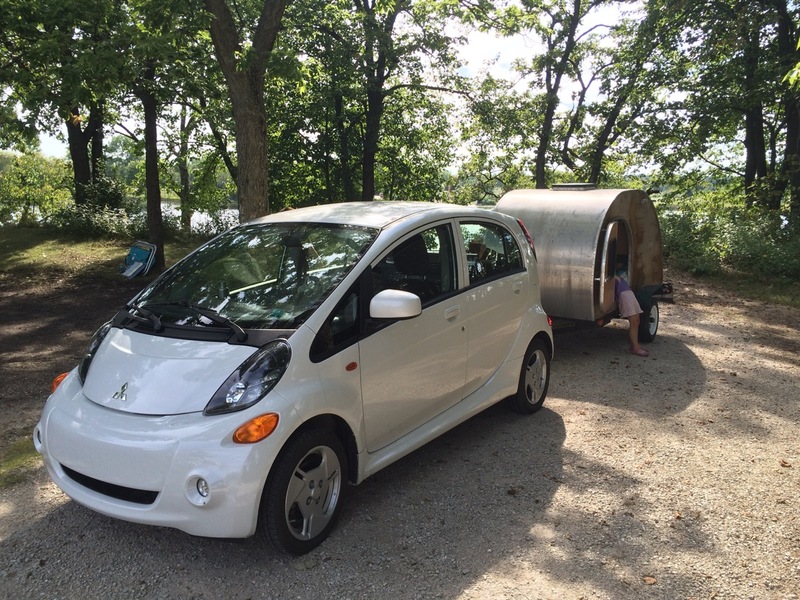 The i-Miev is a great local camper, and there’s nothing like trailering down a steep grade with all that gravity going into regen, not EVen needing the brakes. Now wouldn’t that purple car make a great teardrop wagon? Every time i see an RV or a trailer i wonder why it doesn’t have a flexible solar panel on top. It can’t give much current, but it can power a small ΑC or led lights or a fan inside. In my case, I don’t have a solar panel on top because the battery I use in the camper is more than enough for several days of camping on a single charge. The other thing is that ideally, I want to park my camping trailer in the shade, (to stay cool,) where the solar panel won’t do much good anyways! I do have a small panel that I sometimes set up. It has a long pair of wires, so I can run it out into a sunny position. Previous post: On a Bike!